Everybody knows (or should know) that solar energy is clean and green, but there are actually many advantages of solar energy. I’ll run down 11 of them here. I’d also throw in disadvantages of solar energy, but there’s basically just one. Since the sun doesn’t shine 24/7, we need to use other sources of electricity and need to fill in with energy storage as well. Particularly, energy storage (most probably battery energy storage) is needed in order to cover brief seconds or minutes when the sun isn’t shining. This cuts the need for backup fossil fuel plants that otherwise have to run at about 40-90% capacity. Anyway, that’s the only real disadvantage of solar energy that I can think of. On to the advantages of solar energy. 1. Solar energy can (probably) save you money. Assuming you have a roof or field where you can place solar panels, solar energy can save you a lot of money. In many places around the world, electricity from rooftop solar panels is cheaper than electricity from the local utility. In fact, solar panels often save people tens of thousands of dollars. 2. Solar energy is better for our health. I mentioned the “green” superiority of solar energy at the top, but what a lot of people don’t quite catch is that protecting the environment also means protecting our health. Cleaner air and water = healthier, longer-living people. 3. Solar energy fights global warming and catastrophic climate change. The other side of that “environment” coin is the global warming and catastrophic climate change side. Those crises don’t just threaten our health, but also our built environments, homes, food supply, water supply, and overall livability (as well as that of many species). Solar energy is one of the best solutions to the global warming and catastrophic climate change crisis. 4. Solar energy makes the grid more secure. If a large power plant goes down suddenly, either through malice or natural causes, it can cause a lot of problems for the electricity grid. It may even cause the grid to crash, hurting society greatly. Millions of solar panel systems spread all over the place offer a much more secure system. Even if a hundred or a thousand systems go down for some reason, the grid should be fine. 5. Solar energy cuts the need for a lot of transmission. Transmission lines and supporting infrastructure aren’t cheap. They also result in considerable electricity losses. Solar panels can be placed right on top of (or next to) the buildings or infrastructure that need electricity. 6. Solar energy comes at times of very high demand. Electricity is mostly needed in the middle of the day, afternoon, and early evening. Not coincidentally, that coincides a lot with the times that solar energy is most abundant. Why does this matter? Well, electricity generators generally sell their electricity on an electricity market where they compete with other generators. The lowest-priced electricity generally wins, but as more electricity is needed, there are fewer electricity generators competing and bidding at higher and higher prices. So, times of high electricity demand generally see the highest electricity prices. If electricity from solar is available at such times, it is of a very high value and also helps to drive down the price of electricity. 7. Solar energy protects us from fuel price volatility. Non-renewable energy sources have their costs partially driven by the cost of their fuel. That often results it pretty dramatic price volatility. Free sunshine runs into no such issue. The capital costs are almost the entire cost of the system, as even maintenance needs are very minimal. 8. Solar energy is renewable. This is an obvious one, but that doesn’t mean it should be left out. Renewable, of course, means that the resource will “never” be depleted. 9. Solar energy is extremely abundant. “Renewable” doesn’t necessarily mean abundant, but in the case of solar, the energy potential truly is massive. There is no energy resource on the planet that compares to solar energy. 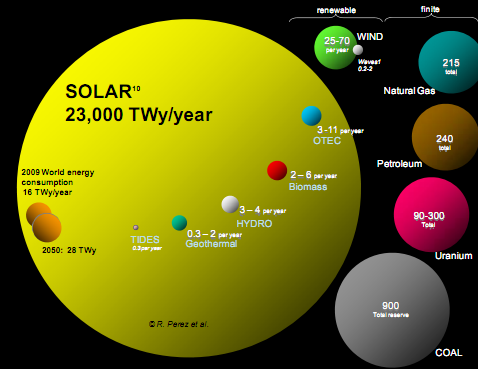 When you look at the chart below, note that the energy potential from solar is an annual figure while the energy potential from fossil fuels and nuclear is energy potential from their total known energy reserves. The difference is insane. 10. 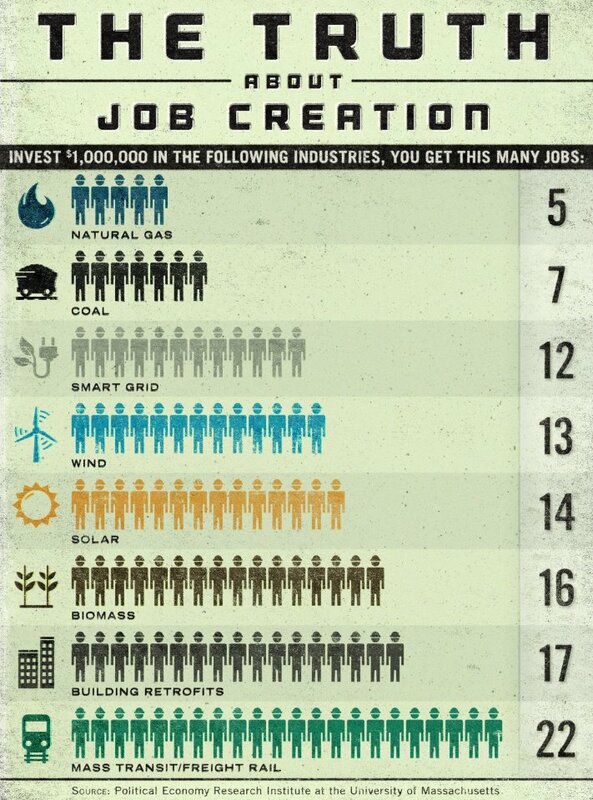 Solar energy is a great job creator. With free fuel, the cost of solar power is mostly in the human labor required to produce and install solar panels. What that also means is that solar power is a big job creator. Rather than sending your money to coal, oil, or natural gas billionaires, when you go solar, you are supporting local and manufacturing jobs. 11. Solar energy needs very little water. Water is one of our most precious resources, and billions of people around the world are suffering from drought and lack of access to clean, drinkable water. Sung a ton of water for electricity production doesn’t help the problem. 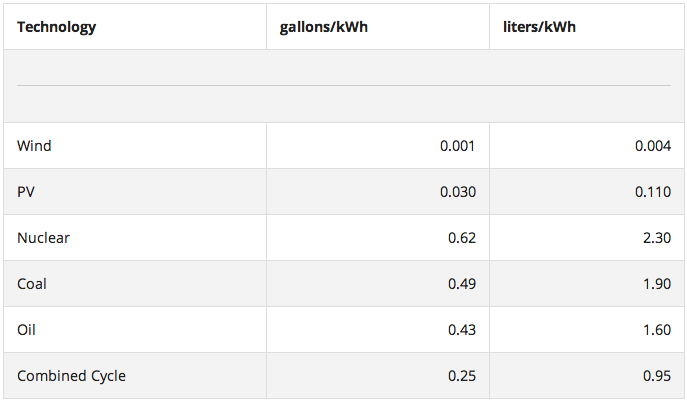 Luckily, solar PV power uses very little water compared to power from coal, natural gas, or oil. 12. Solar energy increases energy awareness and conservation. I think this is one of the most underrated advantages of solar energy. Once you become and electricity generator yourself, you become much more aware of energy usage, and you typically look to conserve energy more. Watching your electricity production, you can better relate to a kilowatt-hour, and you are likely inclined to only use as much electricity as you generate. If you happen to hit that target, you are probably then driven to further increase your generation-to-usage ratio. 13. Solar energy distributes socioeconomic power and wealth much more widely. One of the other most underrated advantages of solar energy is that it better distributes wealth and socioeconomic power across society. Instead of monopolistic energy companies, you have hundreds of millions of people generating electricity. That democratized the electricity system. The Electricity Grid Is About To Change… A Lot!